Following the International Triathlon Union (ITU) Executive Board meeting held in Rotterdam, and the ITU Annual Congress, the international governing body of triathlon has announced the calendar for the 2018 season. With 7 ITU World Triathlon Series (WTS) events plus the ITU Grand Final; 18 ITU World Cups, three ITU Paratriathlon World Series and six ITU Paratriathlon World Cups, ITU notes that the season is going to be busier than ever. In its tenth season, the World Triathlon Series will feature at eight stops, with one city debuting for the first time in the calendar. The WTS will again get underway in Abu Dhabi on 3 March, to then move onto a new addition to the calendar, Bermuda. The Atlantic Ocean island will host its very first WTS race on 21 April. The next stop will be Japan for one of the longest running events on the calendar, Yokohama, where triathletes will be performing on 12 May to then move over to Europe for the third edition of WTS Leeds, which will take place on 10 June. The series will continue its journey through Europe to Hamburg, not only for a WTS race, but also one of the most spectacular events on ITU’s calendar, the Mixed Relays World Championships. The excitement and emotions of the team event will be showcased again in front of thousands of spectators on the weekend of 14-15 July. For the second year in a row, two Canadian cities will host a WTS race. First, triathletes will stop in Edmonton on 28-29 July for ‘a fast and exciting race on a challenging course’. The last stop before the ITU Grand Final will be Montreal, ready to welcome athletes to the old port on 25-26 August. The golden beaches of the Gold Coast will host the Grand Final, as well as the Junior, U23 and Paratriathlon World Championships on 12–16 September. ITU is working with various WTS events and National Federations on the creation of the first ever Mixed Team Relay Series, which is expected to be announced in a few weeks. 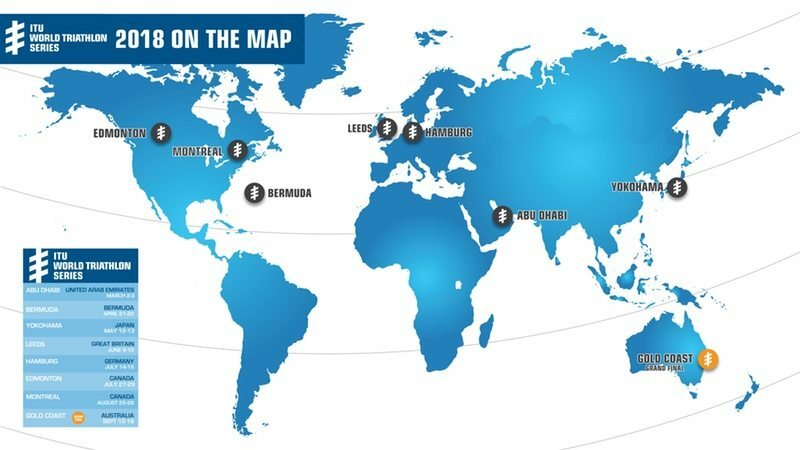 The second-tier events, ITU World Cups, will have a new and revamped calendar in 2018, with 18 races across the globe. First stop will be Cape Town in February, and last one will be in Miyazaki (Japan) in November, and in between, ITU notes that there will be all kinds of scenarios for races in Sprint, Olympic and Semi-finals and Final formats. Also revamped is the World Paratriathlon Calendar and in its second year of existence, the family of the World Paratriathlon Series will have a new addition to the calendar. In 2018, paratriathletes will start the season in Yokohama, along with the WTS event, and then will head to Iseo (Italy) for the first time ever as a World Paratriathlon Series event, after organising multiple paratriathlon races during the last decade. Edmonton will follow for the world’s best paratriathletes and then the WPC will move onto closing the season at the Gold Coast World Championships. It’s a full racing calendar with six Paratriathlon World Cups in four different continents as well as Paratriathlon World Cups (with dates to be released in the coming weeks).